Rebecca Trehy grew up in the beautiful mountains of Colorado and earned her BFA in Theatre from the University of Colorado in Boulder. She has always loved music. When she was 8 years old, she sang with John Denver and the Earthbeat Children’s choir in her home town near Aspen, CO. That same year she got her very own guitar and has been singing and writing her own songs ever since. She taught many children’s theater, music, and art classes as a teaching artist at Theatre Aspen, Storytown in Chicago, and Earthbeat Children’s Choir in Aspen. Since moving to Los Angeles, she has had the great honor of working as a caregiver for many wonderful families. Rebecca joined our team in the art room in May 2017. She completed her PLAY music apprenticeship the following fall and winter, and we welcomed her to our music staff in spring 2018. 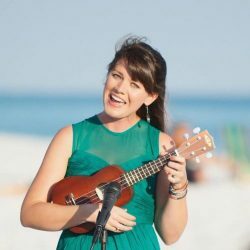 In her free time, Rebecca loves to make up stories and songs, and also enjoys crocheting blankets and creating hand-made cards and banners for friends and family. She is thrilled to be working at PLAY where she can combine her two great passions in life, the arts and working with children.